The Smoky Mountains are practically full of opportunities for vacation fun and adventure. With awesome attractions, excellent shopping, and delicious restaurants, it is clear why so many vacationers choose to visit the Smokies. Of our many vacation cabins, our 4 bedroom cabins in Gatlinburg, TN are an excellent choice for larger groups staying in the Smokies! These rentals can provide ample space for vacation fun and relaxation. You can ensure that everyone in your family or group has adequate space for a restful and relaxing stay. For adventurous vacationers, the Smoky Mountains are simply full of things to do and see. When you stay in a 4 bedroom Gatlinburg, TN cabin, your group can be close to Dollywood, great local attractions and the national park. Booking a convenient log cabin can guarantee that you don't waste that well-deserved vacation time driving. Instead, spend that time experiencing the splendor of the Smokies! No Smoky Mountain vacation experience is complete without our excellent in-cabin amenities. There is no doubt that your group will love the chance to relax in the steamy waters of a hot tub or take in the stellar mountain view from their cabin's wrap-around deck. When you book a cabin with hot tub or other excellent amenities like game rooms and pool tables, you ensure your group will have a quality Smoky Mountain vacation! Though there is more than enough to do and see in the Smokies, your rental cabin with luxury amenities is bound to be a hit with your family or group as well. No matter the occasion: anniversaries, family vacations, reunions, reconnecting with friends, or celebrations, our vacation rentals with awesome conveniences can make your gathering a success. Be sure not to miss out on experiencing these top-notch amenities as part of your four bedroom Smoky Mountain cabin in Gatlinburg. If these 4 bedroom cabins in Gatlinburg, TN are not quite the right size for what your group requires, feel free to browse some of our other rentals by bedroom options. We also offer affordable 3 bedroom cabin rentals in Gatlinburg, TN for slightly smaller families and groups. There are also many 5 bedroom cabins that can easily accommodate larger gatherings. When you book with Cabins USA Gatlinburg, you will receive a 15% discount for online bookings. Don't miss these great vacation savings for your stay in the Smokies! "2nd Choice" is a beautiful vacation rental in Sevierville with 4 bedrooms, a hot tub, game room, and an excellent view of the Smoky Mountains. Enjoy "A Peaceful Easy Feeling," a Dollywood cabin rental in Hidden Springs Resort that's only 5 minutes to the entrances to Dollywood and Dolly's Splash Country. Escape to the Smoky Mountains at a resort cabin rental near Dollywood and Gatlinburg that offers an indoor resort swimming pool, WiFi Internet, and more! Come enjoy a mountain escape at this Hidden Springs Resort cabin for rent in Pigeon Forge. “Knockin’ on Heaven’s Door” offers guests a 4 bedroom cabin with indoor swimming pool access next to Dollywood. Stay at a log cabin with jaw-dropping views in the Great Smoky Mountains of Tennessee near Pigeon Forge, TN. Sleep 10 guests in premium log cabin comfort! Located in Grand View Resort, "Majestic View" is a lovely 4 bedroom cabin that sleeps up to 16 guests, offers resort pool access, and a great location in Sevierville. Gatlinburg area cabin rental near Dollywood. Shakonohey is a 4 bedroom resort cabin near Gatlinburg with both outdoor and indoor resort swimming pool access. Experience a Smoky Mountain cabin with a view in the Upper Middle Creek Rd. area! This premium cabin sleeps 12 guests and has 4 bedrooms. This comfortable 4-bedroom cabin in Gatlinburg offers guests a 3-level deck, hot tub, jacuzzi tub, and more! Book today and receive a 15% online discount! Cabins USA offers beautiful cabins in Pigeon Forge near Dollywood. Resort cabins like "Fishin Hole" with pool access provide guests with the perfect lodging for their stay! You'll find Mistletoe Lodge in a prime location only a short drive from Downtown Gatlinburg and the Smokies Arts & Crafts Community. Book today & save 15%! Vacation in a 4 bedroom cabin in scenic Wears Valley with amazing mountain views! 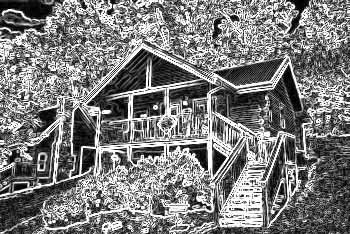 Suite Retreat cabin rental sleeps 10 in a tranquil wooded mountain setting. Escape to this Cabins At The Crossing Pigeon Forge cabin and enjoy an affordable and elegant cabin rental with swimming pool access. Plan your mountain getaway at "Black Bear," a 4-bedroom cabin with hot tub and deck near Gatlinburg that's perfect for you vacation.